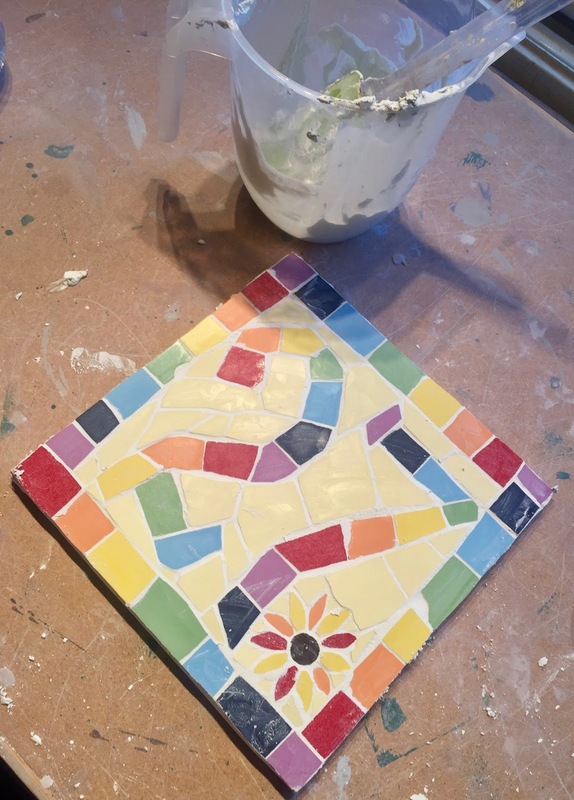 An exciting mosaic new year! 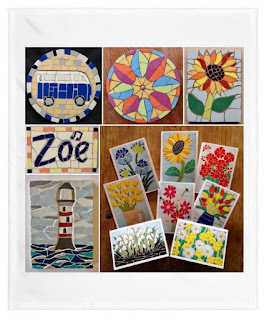 As 2017 comes to an end and I have had a lovely Christmas break with my family and friends, I am starting to look ahead to what 2018 has in store for my mosaic business. I spent the last few months of 2017 making a lot of smaller mosaics for Christmas presents, which was great and I feel very lucky to have been so busy. But the beginning of 2018 brings something very different - a large fish commission for a client's kitchen. So, the first few months will be taken up with one mosaic. I am very much looking forward to making it, and having the time to immerse myself in creating a large work of art. The commission came about from a phone call to my business line one day - 07944 635487. The caller said she had seen my work in a fish restaurant in Oxford, and had taken my card a few years ago. 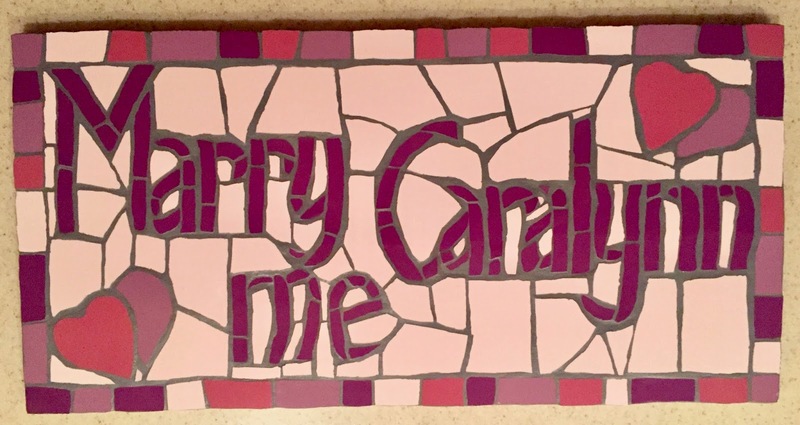 She and her husband were now in a position to commission a mosaic for their kitchen, and could they come a visit me at my studio? No problem. They came here in early December to discuss what they wanted and if was possible (which of course it was!). They were particularly taken with the marlin mosaic (see below), which I was very happy to make for them - obviously it would be unique to them, but along similar lines. 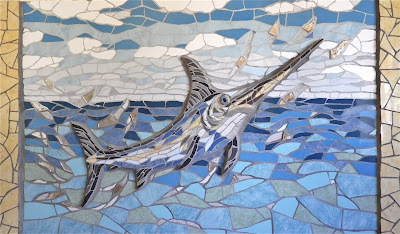 They especially liked the movement and lift of the marlin, and the splashes of light, which were hand made tiles. Before we could go any further, my clients had to decide the size they wanted. I always suggest clients blu-tac a piece of newspaper on the wall to see what size would work in the proportions of the room. This is what they did, and emailed me a size, asking for a quote. We agreed on a price and up front deposit and I put their commission in my order book for the new year. Exciting! So, blogger friends, I will attempt to give you a weekly update on the progress of the marlin and I would be really grateful if you could share it with your friends and followers - anything you can do would be much appreciated! 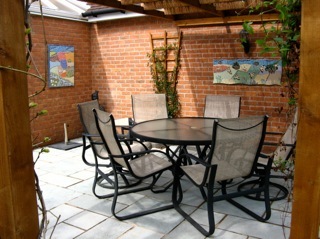 I often ask people who buy my mosaics to send me photos of the mosaics in situ. 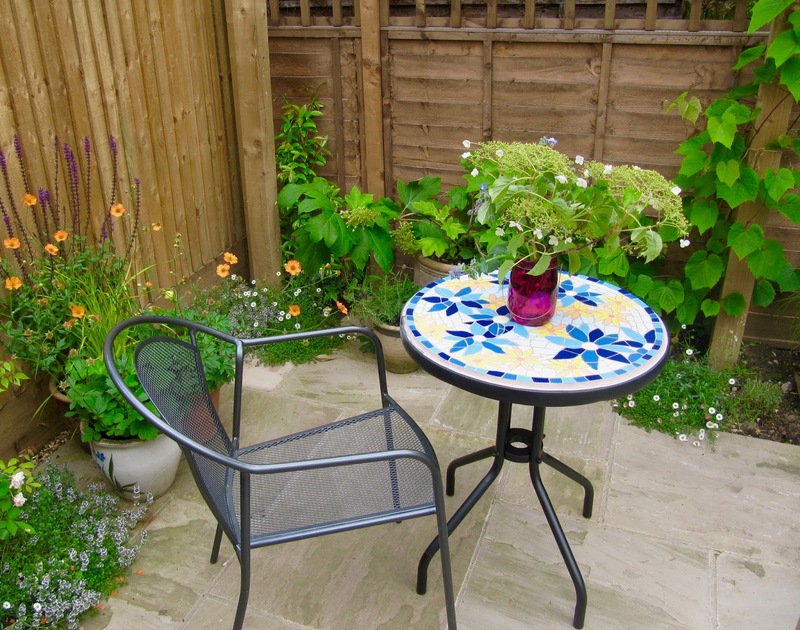 Partly, of course, because it is lovely to see where they finally rest, and to see how they look - and also because it gives people who are thinking of buying or commissioning a mosaic how it might look. Often we don't purchase a piece of art, no matter how much we are drawn to it, because we are not quite sure where to put it. Hence the photos in situ. I have a large collection of them now but have just chosen a few for you to have a look at, with a little explanation of each underneath. 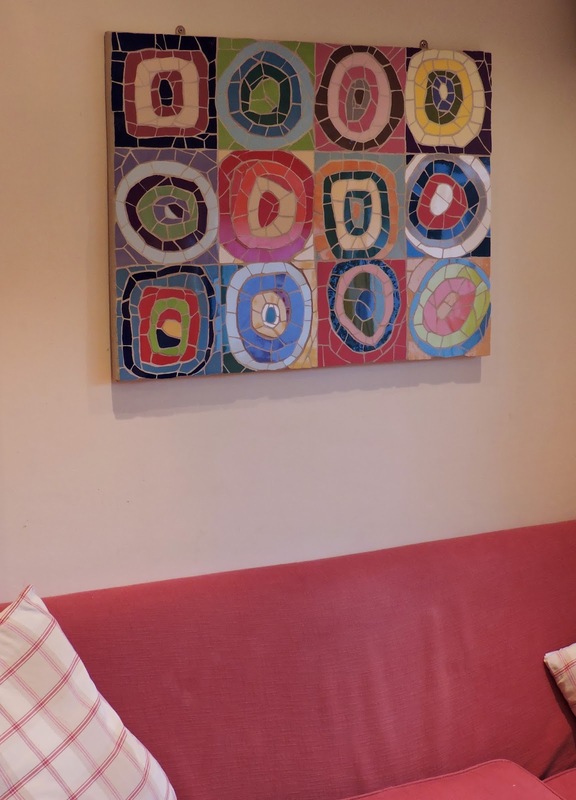 This is a Kandinsky inspired mosaic hangs in our kitchen, and lifts my spirits every day! Two very different mosaics in this bathroom - on the left a wave mosaic which is just tiles and wood. 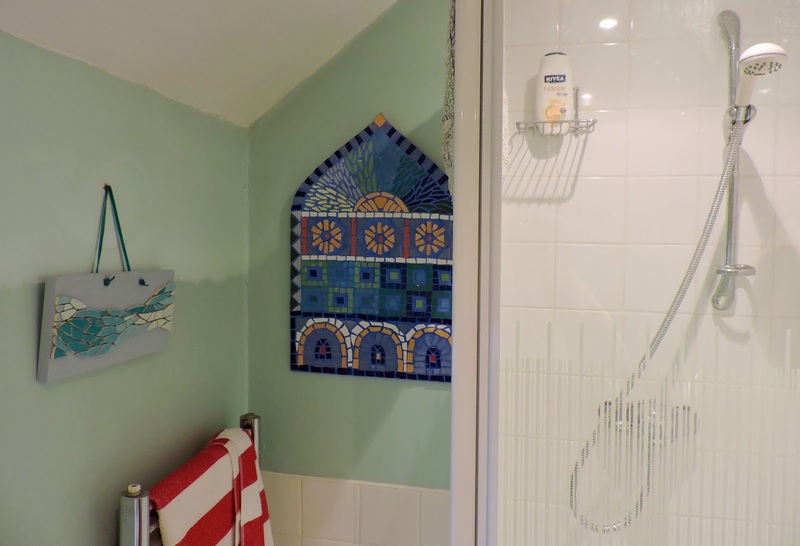 On the right is a Moroccan inspired mosaic in which I have used a Mediterranean blue grout. To the left of the door of this Coastguard's Guard cottage, is a exterior mosaic of a local scene in Devon. 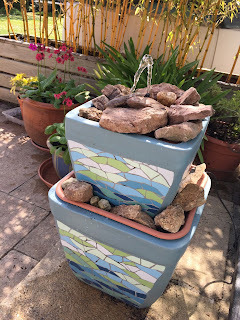 In this church, I mosaiced the inside of the font and made matching wave panels each side. 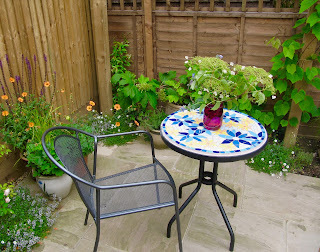 See one of my garden benches nestling in this garden - a work of art, and so useful! 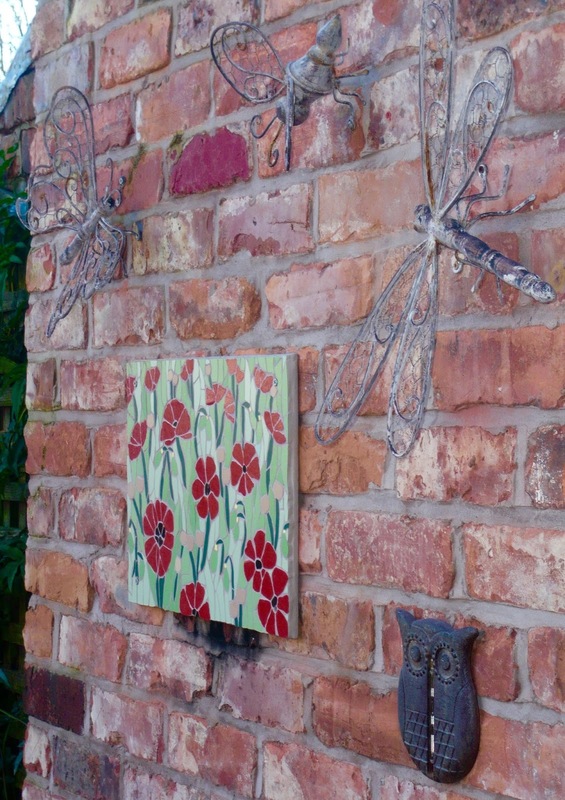 Here is an exterior poppy mosaic to add to my client's collection of wall art. Many thanks for reading, and I would really appreciate you sharing my mosaics with anyone you think might be interested. 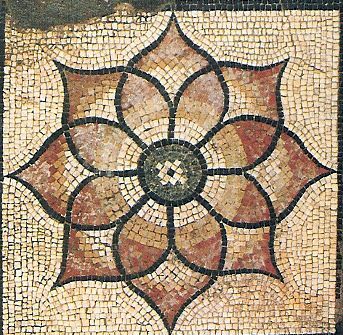 As in life, things don't always go right, and I have experienced that recently with a commission to make a Roman design mosaic table. To start off with, it is a different style for me which I was/am excited to try - I always like a challenge! The precise nature of a geometric design meant a lot more measuring and checking, which I thought I had done! 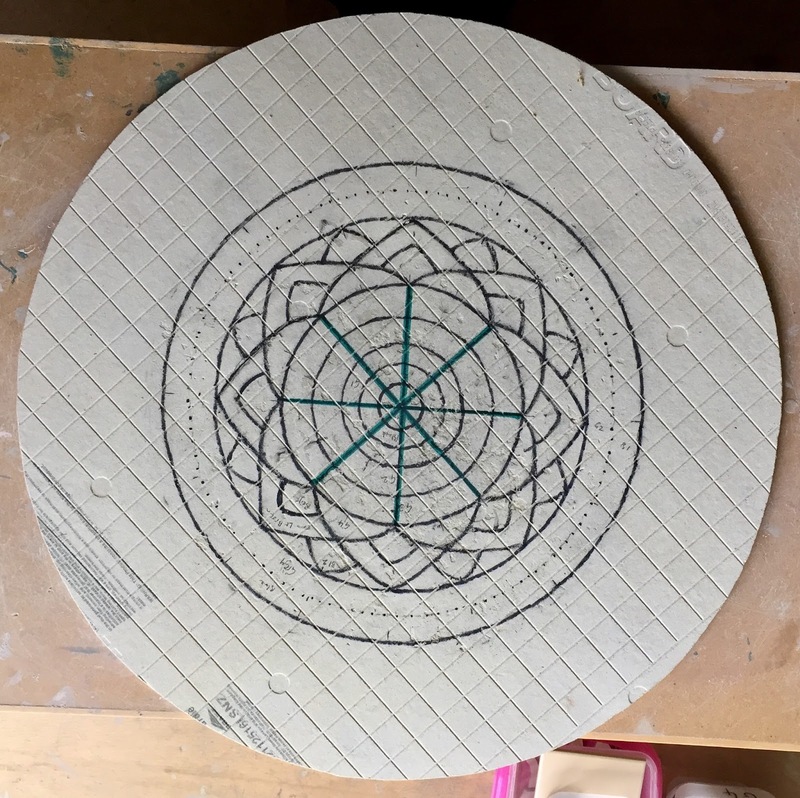 Below is a design I found on Google images, which my client liked for the centre of the round table, so I sort of based my middle design on that. My client wanted greys as a colour palette with blues and beiges. So off I went, drawing the design and starting to cut and stick the tiles. 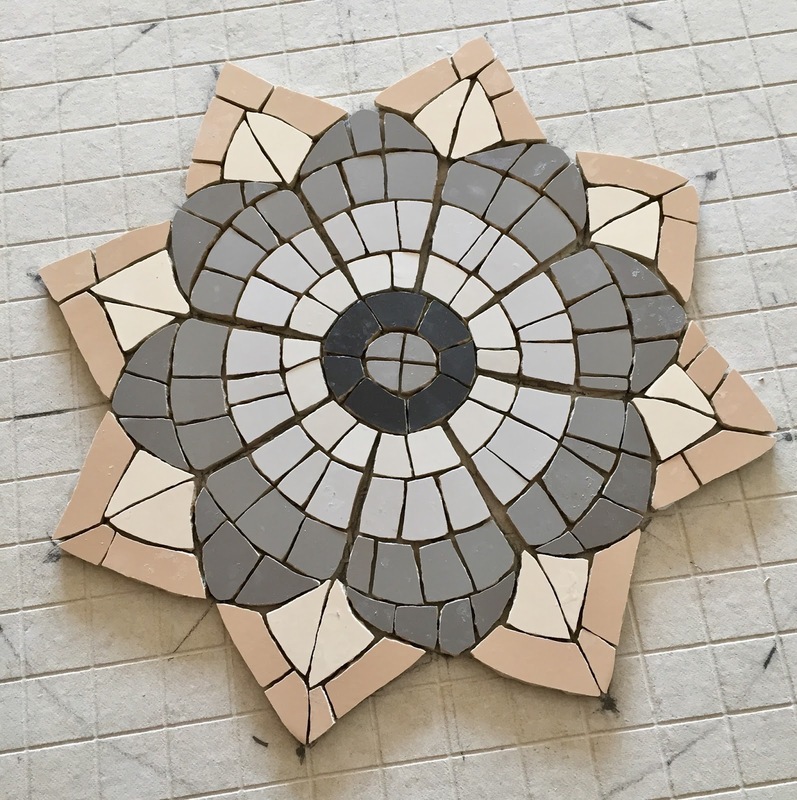 Here is my original design, and the progress I made with cutting and sticking the tiles. It all seemed to be going well, until I made the devastating discovery that what I thought was the middle, wasn't the middle, so when everything needed to be the right measurements, they weren't! What to do? Nothing, but take every single tile off and start again! 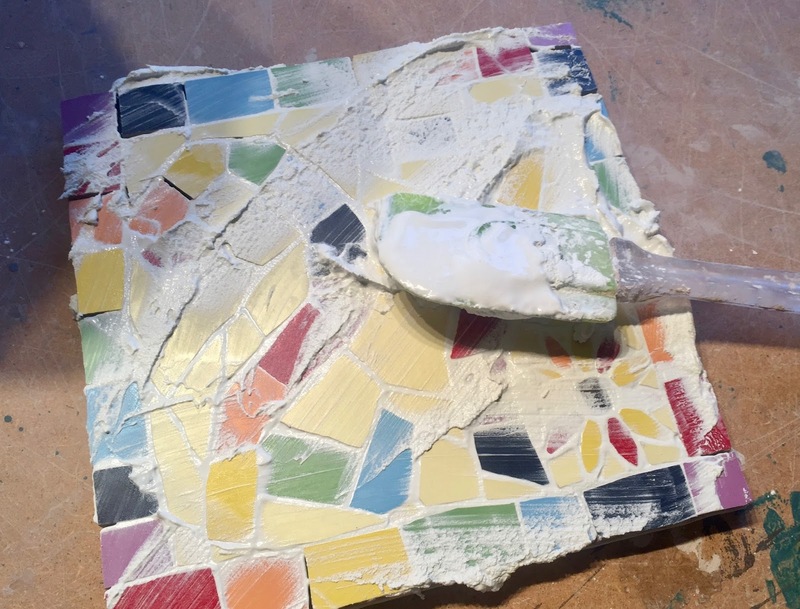 The actual process wasn't as daunting as it sounds, and I collected each colour tile in a tub so I could reuse them in some shape on the Take 2 table design! With some help from my husband who is very good at these things (and had pointed out the problem in the first place! ), we now have a perfectly central design drawn, and it's time to start again. Of course, it HAS to be right! 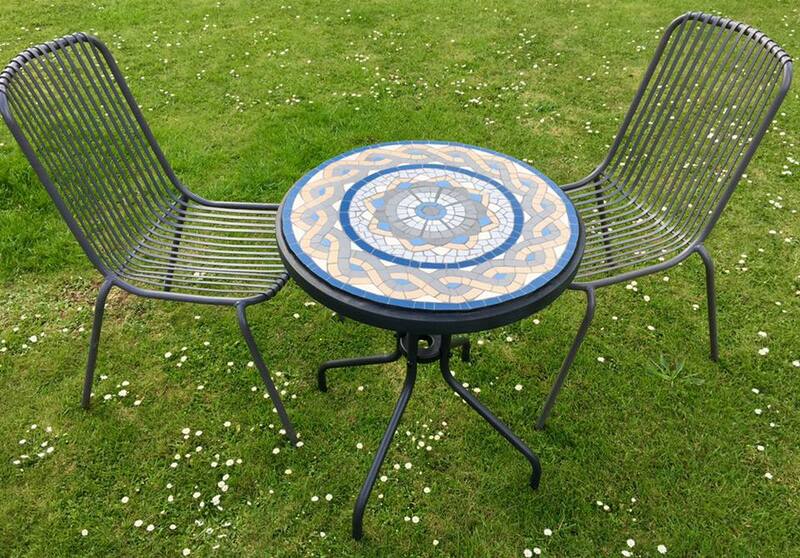 When all is completed, I will share the finished table with you, and hope you like the centred Roman mosaic design! 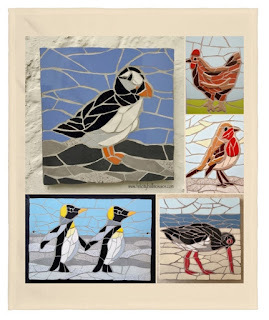 Do get in touch, and if you like my blog and mosaics, it would be great if you could share. Once in a while I am commissioned to make really special mosaics. Obviously, I feel that all my mosaics are special, but some just make my heart race as I make them. So, a few months ago, I had an email from a chap who wanted me to make a mosaic for his girlfriend, saying 'marry me'. Well, I was so excited - what a lovely romantic gesture! 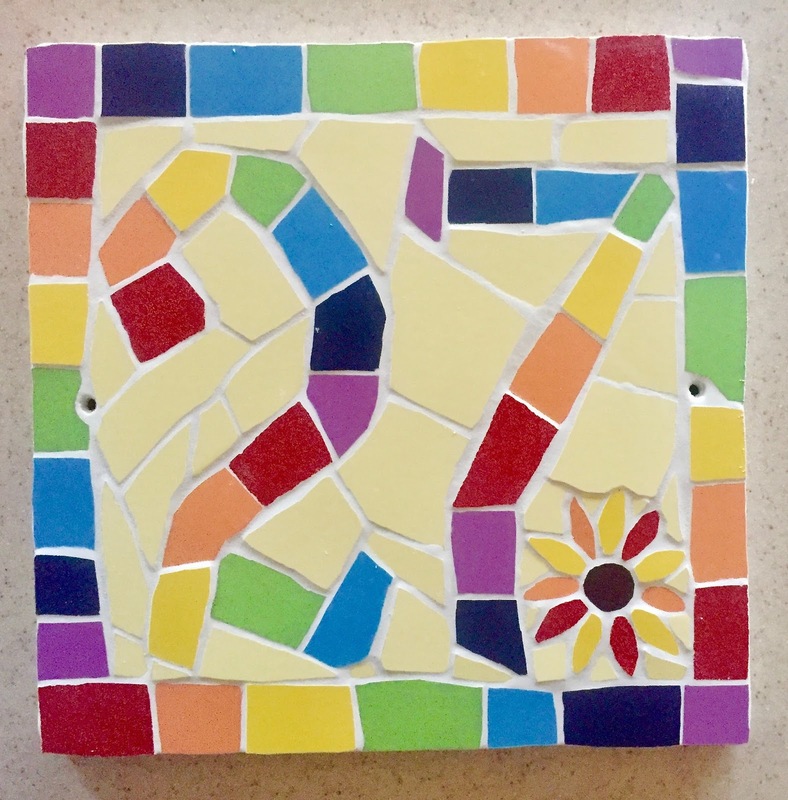 We discussed all the details and designed a special motif together to fit in the mosaic - something special to them. What an honour to part of such a special moment in a couple's life! Anyway, I made the mosaic posted it off with all my good wishes and positive thoughts. I didn't hear for a while .... until yesterday, when an email told me the great news that all went well - she said YES, and seemed to like the mosaic too! How I grout a rainbow mosaic house number with sunflower motif! I often get asked how I grout my mosaics. 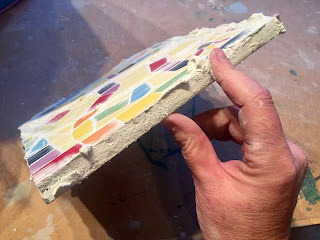 I must say from the beginning that no one has ever taught me - this is the just the way I do it, and it is seems to work pretty well, so this is for all you budding mosaicists out there! 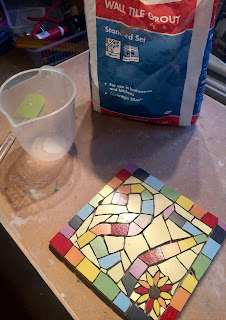 I measure three serving spoons worth of the powder grout (about the right amount for this 20cm x 20cm mosaic), and mix in small amounts of water until I have a buttercream consistency, the same as in the middle of a cake, mixing it together with the spatula. 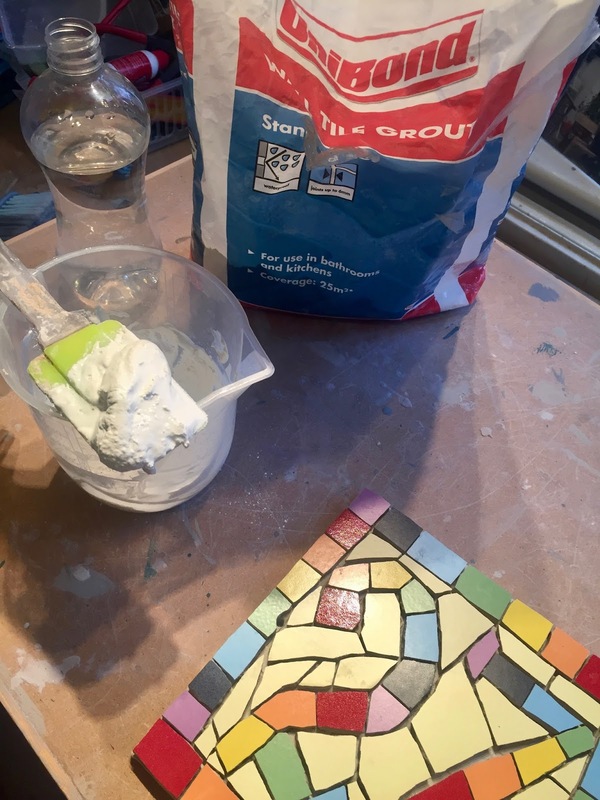 Make sure you don't get a dry lump of grout at the bottom of the jug! Next, be brave and get spreading! I work the grout firmly into all the spaces between the tiles. I keep going over the mosaic, spreading the grout on thickly, and then scraping it off with the soft edged spatula, again and again. 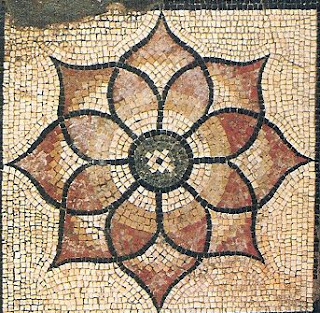 The edges are very important in mosaics - especially for this exterior house number - as that is the place where water might get in. 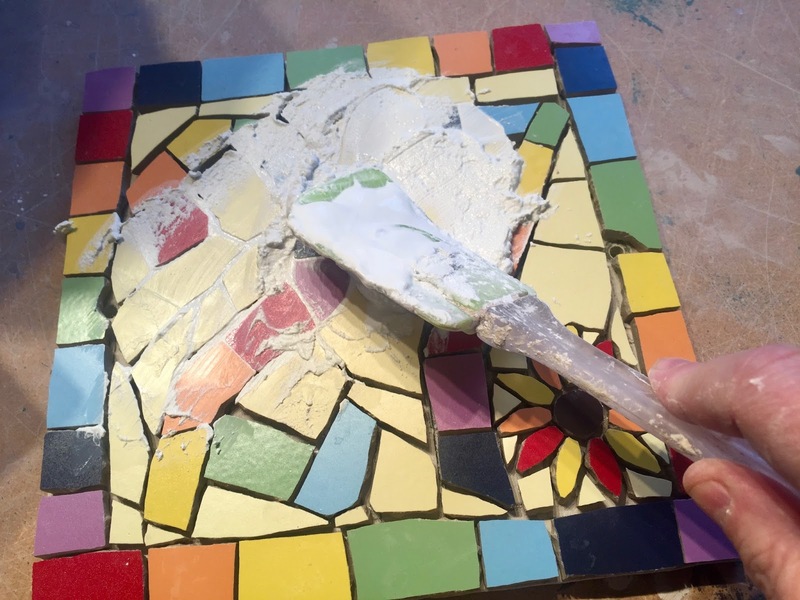 I use my index finger to press the grout right into the edge, going round and round the edges until I am sure it is all completely covered. - be careful for sharp edged tiles! 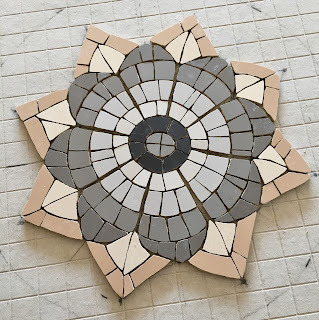 I wipe all the excess grout off, checking once again that there are no gaps - it's amazing how grout sinks and suddenly a hole appears from nowhere! 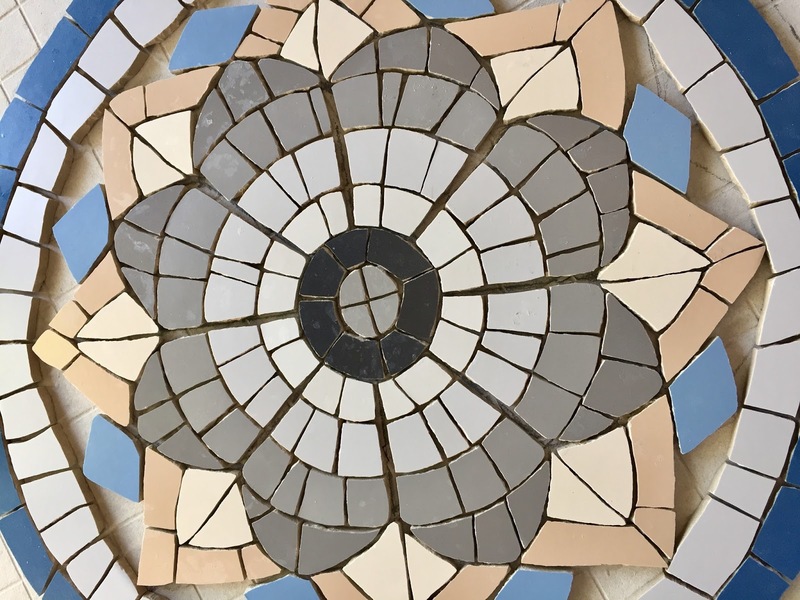 If you have any questions about making mosaics, or a project you are working on, do leave me a comment and I will do my best to answer it for you. Thanks so much for reading, and look forward to hearing from you. 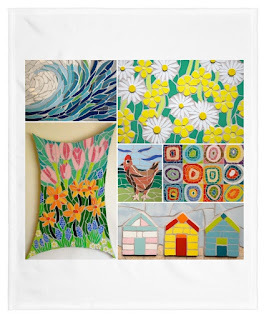 This is just a little blogette to let you know about all my lovely Pinterest boards. I have been on Pinterest for quite a while now and really enjoy collecting all sorts of arty pins I like, just so that I have them in one place and can go back there and enjoy them whenever I want! There is so much amazing work out there of all media, and its such a pleasure to have my very own gallery at the press of a button. So, I thought, if you are a Pinterest person (or even if you're not! ), you might like to join me there sometimes too. Here is the link to my boards - https://uk.pinterest.com/justmosaics/ I am always adding new pins so do keep an eye open, and I look forward to your company over there! Happy new year, blogger friends! With my business this year, I am going to try and learn from last year's mistakes - that's a good start to the year, isn't it?! Last year, I received orders for my popular mosaic bistro tables too late for me to make them in time for spring and summer. I did make them all in the end, but felt terrible, when the sun was shining and my customers didn't have their tables to sit at. So, I know it only January and sunny days seem along way away, but I am now encouraging everyone to make their orders now, so that all shall be well and you can enjoy a glass of something the minute the air warms and the sun shines. Thank you for reading and I would be really grateful if you could share my blog with your family, friends, and followers.